That afternoon, Roger, the simpatico service rep, called to say the car wouldn't be ready and indeed had a problem with overheating -- the coolant was perhaps leaking into the engine and could be hitting the spark plugs; there was a misfire on the #3 cylinder; and the lifters were rattling. He'd put me in a rental (no charge) for up to three days if needed, so I got dropped off at Enterprise across the street from Stewart and drove off, unconcerned, in a rented Aveo. By Friday, the three days were up and the problem was not solved -- Roger told me they were trying to get the Aveo to a "heavy-duty tech" and said I'd have to return the rental Aveo. He put me in the dealer's loaner, a 2002 Malibu -- a gas-guzzling, steering- and suspension-less boat. Yes, I know -- it was a free ride -- fine for a couple of days. Stay with me. A week passed, and still no Aveo. The diagnosis by the heavy-duty tech, however, did arrive: a cracked cylinder head. (At this point I'm writing primarily from memory, as it had not occurred to me that I should be documenting the details of dropping off my car for an oil change.) "They are still awaiting the part," Roger said, "which comes on a [slow] boat from South Korea. Don't worry, you can keep driving the Malibu in the meantime..." Little did I anticipate that in the midst of all this, the automobile industry would tank. The coup de grâce came on November 19, when the Big Three CEOs, including my Aveo's leader, flew to Washington in their private jets to ask for a government handout. The backlash ensued. Car dealers were suddenly shutting down without notice. San Francisco's Chrysler Jeep dealer closed without warning, leaving cars that were in for service trapped behind locked fencing. What would become of my dealer, my cylinder head, my car?!? I stopped by nearly every other day to check the status with Roger, and was beginning to feel a bit like a stalker, with no leverage. They were awaiting the part...still awaiting the part. My Aveo was being held hostage by South Korea and the tanking economy -- I could not drive it away, and feared that one day I'd pass by to see the dealership closed and my otherwise undriveable car in prison and behind bars. On one visit I demanded to speak with the Service Manager, an unsimpatico fellow who looked me in the eye with an air of empathy -- "Let me check into your situation and call you in the morning." Never heard from him. The situation is getting dire. I have got to get my car back! Every day I drove past the dealer on my way to work to witness an automobile graveyard, completely dead but for the couple of salesmen standing around for a smoke. I found a glimmer of reassurance in the long line of cars checking in for service. But it was barely a glimmer. On November 24, 2008 [Day 20], I began taking notes. Still driving the 2002 Malibu boat and with the Thanksgiving weekend approaching, I decided to register a complaint with Chevrolet. I called their customer service number and met Diane, who opened up my case. "Do you have a rental or loaner?" "Yes." "I've checked and there are no outstanding recalls on the Aveo. Let me put you on hold and call the dealer." She spoke to Adolfo in the parts department and got the same story -- the part is coming from South Korea and will arrive no later than December 5, but it could be sooner -- and it's being delivered straight to Stewart, not to another dealer from which it would have to be transferred, adding more to the delay. On December 1st I called the parts department and learned that the cylinder head had just arrived!!! Finally, an end in sight! I left a message with Roger, who in turn left me a message to confirm that the part had arrived and they'd begin work on the car the next day. Perhaps I'd be able to pick it up in the evening! He sounded as glad to have me off his back as I was at the thought of having my back back in the car. December 2nd arrived, and Roger left me a tentative message. "Well, they started the work but then noticed metal shavings in the part. They have to order a new one..." I called Mr. Unsimpatico to complain into his voice mail, saying that it's been one month that my car has been there. "I talked to you 2 weeks ago expressing my dissatisfaction. You promised to check into it and call me, but you didn't. I want an Aveo to drive, whether a loaner or a rental from Enterprise -- I drive over 250 miles a week -- I want resolution to this matter. Do something! ANYTHING!" No return call. I went to the dealer that afternoon to speak with him in the flesh. He offered neither solution nor explanation, and would not give me a different loaner car. He said that providing me with a rental Aveo and covering the cost would be up to Chevrolet, not him. And then he mentioned the Lemon Law... If a car is in the shop for more than 30 days, or three or more attempts to repair a problem are unsuccessful, it can be considered disabled and one can go to arbitration on the matter to get a like vehicle from the manufacturer. I set off to research the labyrinth of information on the Lemon Law, known as the Song-Beverly Warranty Act in California, and whether I could (and should) pursue it on my own, or through the Better Business Bureau, or with one of the myriad shyster attorneys that specialize in these matters. I decided to keep studying and go it on my own. Meantime, I left a message with Diane explaining the new developments and asking for resolution. No call back from friendly Diane. On December 3rd Roger left me a message to say the replacement part was in. I tried several times to reach him to check the status -- no return call. Same for December 4th -- I'm clearly being avoided, but why? On the morning of the 5th I stopped by to learn what Roger didn't want to tell me. It was this: The second part had arrived, but was visibly defective. They would have to order another, from another slow boat from South Korea. You see, one of the efficiencies in contemporary inventory control is that dealers no longer maintain an inventory that could sit on the shelf, unused. I again asked for an Aveo loaner/rental in place of the Malibu and sympathetically, or out of guilt, Roger made it happen. Back into the same Enterprise Aveo I started with 31 days ago -- and my car now officially qualified as a "lemon." "Sorry it's taking so long," said the message friendly Diane left at home (while I was at work) on December 5. "I'm still on top of your concerns as to when the part will arrive -- but it will not be within the next couple of days, but you can call me or speak to anyone between 10:30 and 7:30 EST M-F -- I will call you next Wednesday between 3 and 5 -- so sorry." I tried to reach Diane on December 9 and left a message with my daytime phone number, should she really want to reach me. I called Diane on Wednesday, December 10 -- she said that there were no parts at the local GM dealers and they had gone back to South Korea. The part should arrive Thursday or Friday. Roger left me a message Friday morning saying that the work was in process and could be done by the end of the day. I left him one back to say that I was leaving town mid-day and would have to pick up my car on Monday. Diane phoned around 2 pm to say that the case was now being transferred to a district specialist, and again apologized. I sent the official, certified letter to GM stating my request under the Song-Beverly Warranty Act to have the car replaced, copying Frank. Monday, 11 am on December 15, I stopped by the dealer to get my car. The work was not complete. Roger and the service manager were out for an early lunch. There was no one to talk to, but I refused to leave, and eventually was escorted to the service area to speak with Robert the mechanic, who was working on the car. He said it would be done by the end of the day, but he'd like to keep it overnight and cold-start it in the morning to make sure the rattling was gone. What's one more day, at this point? "No problem." That evening I received a message from Parker, the GM district specialist -- my new handler -- checking on my case. 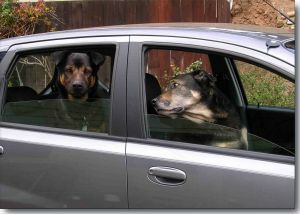 The next morning, December 16, I phoned Roger, who said the car was ready. I returned the rental Aveo and was reunited with my car at 11 am. Day 43. They handed me an invoice for $44.23 for the oil change! With little strength remaining and that invoice standing between my car key and me I reluctantly paid it. "Choose your battles," I calmly advised myself. The next battle was about to begin. With my Aveo lemon back in hand, I embarked on the next phase of the ordeal. At 2 pm I phoned Parker, who was gathering information from the dealer. A field worker was looking into getting me in a replacement vehicle. He told me the repurchase is handled through the dealer and the decision to repurchase is handled by the regional rep. It's my responsibility to locate the replacement car. It was time for a little vacation -- from both my day job and my car problem. Aubry and I played phone tag on the 23rd and 24th, and then I gave it a rest until January 5. Happy New Year...let the negotiations begin. Aubry explained to me that he had spoken to Frank (yes, I know...) and that once a vehicle is out 30 days it is eligible for repurchase, and the only reason my car was eligible was because of the time in the shop. My repurchase cost would be based on the Manufacturer's Suggested Retail Price (MSRP) of the new car minus that of the old car. That plus a usage fee that is calculated (by law) based on the mileage on the old car divided by the expected life span (120,000 miles [!]) times the purchase price, or 26,000/120,000 x $10,560 = $2,287. He offered to only charge 20,000 miles against the car, which would mean a usage fee of $1,750. I began the search for my new car -- unfortunately there were no 2007s to be had, nor 2008s -- so they said. The redesigned 2009 has angular lines where they once were smooth; the front end now has grills that resemble something between an Audi and a Mack truck; neither of which were an improvement, in my opinion. On top of it, the MSRP to MSRP was apples to oranges -- the 2007 was unadorned with accessories, and I had paid an additional $2,500 for air conditioning and a CD player. These amenities are standard on the 2009, as well as satellite "OnStar" services...and the MSRP is now up to $14,255. I paid a visit to my friend Frank on the 7th to talk about the options, and we called Aubry. "I'm here with Jan -- she's very calm, reserved, -- nice lady -- not our usual angry, demanding customer." He went over the issue about the accessories I'd added to my car, noticing that I was taking copious notes. "She seems to be a pretty nice woman and if there's something you can do, this is someone you should do it for." It was discussed at that visit that GM pays the tax and license for the new car. Me: I really want to stick with the Chevy Aveo, but I'm concerned about having these problems again. Them: The Aveo is a very reliable car. Yours was unusual. Me: So I just happened to get pick the lemon? Them: There's nothing wrong with your car. The only reason we're replacing it is because the law says we have to since it was in the shop for more than 30 days. Me: But I'll still face the risk of faulty parts coming from South Korea. Them: We rarely have this problem with the parts. Your case was unusual. Me: Why was my car overheating, and getting a cracked cylinder head at 26,212 miles? Me: If mine was unusual, then it must be a lemon. Them: There's nothing wrong with your car. On January 20, Scott from the GM repurchase program entered my life. He's giving me $2,430 for the "aftermarkets" (code for the A/C and CD), bringing the MSRP to MSRP to $3,695, including sales tax on the difference -- slightly higher than I expected. "I just use the numbers Aubry gives me," he deflects. "I can't make that call [to absorb the tax from the old car]." So, I call Aubry to see what he can do. Can they throw in an extended warranty with the new car? No -- there are laws against that. In fact, he doesn't even think I need an extended warranty -- he approves repairs to be covered by Chevrolet even on high mileage cars if they have a good service record. I can just trust Aubry to be my extended warranty. Sure -- assuming he, Chevrolet, GM, and the dealer are still around. "In any event," he adds, "if you read the lemon law we don't have to pay for the add-ons [aftermarkets; A/C & CD], which we are doing, but I'll call Scott and see what we can do." My head is spinning from all the runaround, still hoping that my good-faith effort to stick with Chevrolet in the midst of the auto crisis will be appreciated. In reality, I'm dealing with a plethora of people who must be fearing for their jobs, and I'd probably be better served by playing the usual angry, demanding customer that they want to make go away. We keep talking and talking and I've not received anything in writing. In the meantime, I found the new car -- this time silver instead of charcoal gray, one of the only manual transmissions to be found, at Putnam Chevrolet in Burlingame. I went by the dealer to have a look and take it for a test drive. When I walked into the showroom, maneuvering around the fleet of unsold Hummers, the unoccupied salesmen began to descend upon me. I immediately stopped them -- "Don't get excited, I'm just here for a repurchase." They quickly retreated. John, the fleet manager, helped me out, then introduced me to Jorge, the service manager, who handles such exchanges. "Can we move the car to Stewart Chevrolet?" I enquired. "It's better to keep it here," Jorge advised. "Besides, I know Aubry, and he likes to work with me because I complete the paperwork properly." I called Aubry the next day with the VIN number. He said he'd start the paperwork and I should hear something next week. January 28, Scott contacted me, requesting a fax copy of my driver license, Certificate of Title, and current registration, which I sent. Two days later, Friday, the offer arrived. My cost? $4,043.76, including charges for tax, registration, license, and title fees. The offer must be signed and returned by Monday, February 2, on which date I phoned Scott and said "no deal -- take off the tax, registration, license, and title fees." Scott said he only works with the numbers Aubry gives him, so he has to call Aubry, who ultimately agreed. I received a revised offer letter with my cost now at $3,553, which I promptly signed and returned. Day 93. It's been a long haul, but I should have foreseen that the end was not in sight. I phoned Jorge to tell him I'd signed the paperwork, and we scheduled an appointment at 3 pm on Wednesday, February 11, to do the car exchange. Over the weekend Gilles, my spouse and companion, and I emptied the car and cleaned it of every last dog hair. Good as new, but for a few bumps and bruises that will hopefully qualify as normal wear and tear. Gilles is skeptical. On that Wednesday, I arrived with my files, the title, and the like. 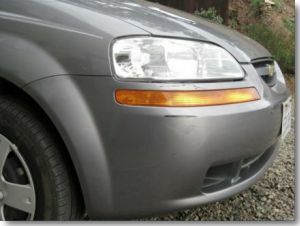 Jorge swept into his office with the GM paperwork, disappeared momentarily to look at the car, and promptly returned to say that the scratch on the front bumper and headlamp cover was unacceptable. He summoned a worker who whisked the car to Putnam Body Shop for an estimate on the repair. While I'm waiting and my heart is sinking beyond the depths of my stomach, I phoned Gilles with the news that he'd been expecting: they're looking for an out. I'm ready to put a couple hundred on the table just to get this over with. Eventually the car returned and Jorge read the verdict: $1,346.15. One thousand, three hundred forty-six dollars and fifteen cents. I'm shocked, livid, speechless but for uttering, "You...have...got...to...be...kidding." He replied, "You don't have to have the work done here." And, "I don't make the rules, I just enforce them." I gathered up my files and the title and went out to the car; sat in the parking lot, leaving angry voice mail messages for Aubry and Scott; called Gilles with the first girl-tears I'd shed since this ordeal began, and decided to stop by and see my friend Frank on the way home. Frank looked at teary me, then looked at the scratch, and was equally incensed. He called up his friend Gil who does the bodywork for Stewart and explained my situation. Gil said to send me right over and he'd give me an estimate, understanding that I just need the car to pass the discerning inspection of Jorge. Gil's bid: $678.57, with his word that if it doesn't pass, he'll fix it until it does. The next day I got a third bid from Jack just for a reality check, as though I'd not done enough running around nor missed enough work so far. This one came in at $400. After much deliberation, I decided to play it safe and go with Frank's guy, Gil. Problem was, I was about to leave town on business for a week. I called Gil and we made an appointment for Monday, February 23. I then made a new appointment for the exchange with Jorge for Wednesday the 25th, hoping by then the repair would be complete. On Friday I called Scott to explain the situation -- that I'll be out of town the following week but have the repair appointment on the 23rd and the exchange appointment on the 25th. "That's fine," he said, "just make sure it gets done or the offer will expire and I'll have to restart the paperwork." While I was away, late the next week, he left me a message to remind me that I needed to get the repair done or the offer would expire. Thanks for the additional pressure, Scott! Back in town on Monday, the 23rd of February, Day 112, I dropped off the scratched car as planned, was picked up by Enterprise to get a rental, which I returned the next afternoon and then picked up the now-unscratched car. Gil's work looked masterful, and the following day it passed Jorge's discerning eye. Two hours' worth of paperwork later the deal was done. "What are you going to do with that [2-inch-thick] file?" asked John, who processed the papers for the new car. "I'm going to write a novella," I replied. He looked at me quizzically, but didn't ask. 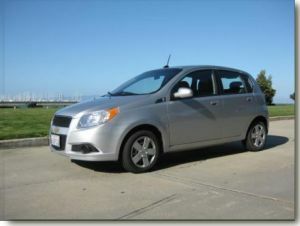 I said goodbye to my good old 2007 Aveo, which by then had 29,581 miles logged, and drove off in my new 2009. I stopped on the way home for a bottle of champagne, and that night Gilles and I contemplated the future of General Motors and joked about the probability that I had picked another lemon. It was just about two years ago when I purchased my first (and probably last) new American/South Korean car. Gilles is starting to make noises about the new Toyota (Scion) IQ that gets 54 miles to the gallon compared to the Aveo's 31 average. Me, I've had enough car transactions to last a lifetime, or at least the lifespan of this little car, which may or may not live to see 120,000 miles. I'll report back in 2017 or at the demise of the car, whichever comes first. In the meantime, I sincerely hope that GM will survive (sans Hummer), and that Roger, the heavy-duty tech, Mr. Unsimpatico, Frank, Diane, Adolfo, Aubry, Robert, Parker, Scott, John, Jorge, Gil, and Jack will be able to keep their jobs, although for many of them job security means having lemons to process. I just hope the next one won't be mine. The final, at least at the time of this writing, amusing detail of this bureaucratic maze came in the form of a check I received at the end of March from Putnam Chevrolet. The check, dated March 27, 2009, was in the amount of $8, with two signatories, and the accompanying letter indicated that it was a refund from the Department of Motor Vehicles correcting the amount I was charged for license fees. I returned it with an accompanying letter clarifying that I was not entitled to this check, as I had bought the car through the GM repurchase program, and since GM paid the registration, license, title, and state fees, GM was the rightful owner. How much money was spent to process this check is anyone's guess. It's highly unlikely that these eight dollars will go far in saving General Motors, and under the circumstances, I have to ask whether our bailout funds will either. Gilles: Husband, lover, companion. He advised me behind the scene, drafted some of the correspondence, but let me swim on my own in the shark-infested pond, assuring that I could call him into the water if need be. As Gilles said to me with his usual sarcastic wit, "these idiots could simply have offered to install a new engine in your car. It would have saved them a bundle and you a lot of angst." Gilles is correct, but I see something much more pernicious in this increasingly dystopian economic system. Think about it: All this wasteful nonsense added to the GDP of the nation! Anyway, I should not end this sorry story without thanking those who genuinely tried to help me, particularly Roger, Frank, Aubry, and Gil. Thank you, good people! Please, feel free to insert a link to this work on your Web site or to disseminate its URL on your favorite lists, quoting the first paragraph or providing a summary. However, please DO NOT steal, scavenge, or repost this work on the Web or any electronic media. Inlining, mirroring, and framing are expressly prohibited. Pulp re-publishing is welcome -- please contact the publisher. This material is copyrighted, © Jan Baughman 2009. All rights reserved.